The local rap industry has yet to receive mainstream focus but 18 year old, Darienne Warren and his Yung Outlaws are hoping to change that. Warren whose stage name is Sizon Klip plans to make it in this world as a rapper. The second of his mother’s three children and the only boy, the young rapper has been creative since birth. 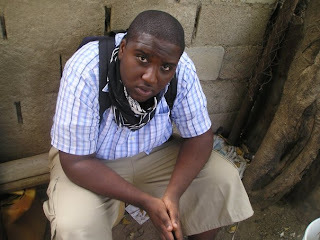 While studying at the prestigious Jamaica College, Warren was bitten by the music bug and has turned back since. He started by learning the songs of his favourite rappers including NOTORIOUS B.I.G who is often compared to both in size and style. As for who is hot right now, Klip says Lil Wayne is the best in the game. Klip says his choice to be rapper doesn’t reflect on his love for dancehall, he loves both genres and this can be heard in his sound. By 15, Warren was building beats and writing rhymes. The Yung Outlaw on the hustle learnt about different small studios in and around the Red Hills Area which he calls home and like any good hustler would, knocked on doors until he could record his rhymes. “Recording ain’t easy it takes money, so I would work or save up my lunch in order to pay for studio time, it’s all about the hustle.” Warren stated. Warren, is also aware of the importance of education, after completing his CXC examinations, he went on to do a year of audio engineering under the tutelage of Don McDowell and is currently enrolled in the Business Administration programme at the University of Technology. As the hustle goes, Sizon Klip is a member of the Yung Outlaws formed by DJ Dominance, a group which consists of deejays, rappers, singers, engineers and songwriters with members from both Portmore and Kingston. Yung Outlaws is it’s own musical movement devoted to highlighting and developing the young artist. Sizon Klip’s first single the Hustlers Anthem definitely embodies all the Yung Outlaw stands for and is sure to make dancehall fans stand up and take notice of what the Jamaican rap world has to offer.